Close up of beautiful creative painter painting on a list of paper in her art studio. Beautiful creative painter finishing her masterpiece in art studio. Close up portrait of young creative painter painting on a list of paper in art studio. Close up of painting process in art workshop. Contemporary creative painter paints in her studio. Young creative painter drawing beautiful flowers on canvas in art studio. 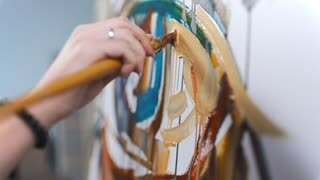 Close up of a male creative painter holding his pallet squeezing oil paint on to it preparing to finish his painting working at his Art Studio hobby creativity design lifestyle concept. Creative attractive mixed race female artitist making a painting on canvas with acrylic paints in own art studio. Positive talented female painter drawing in workhop using wooden easel. Dolly shot.